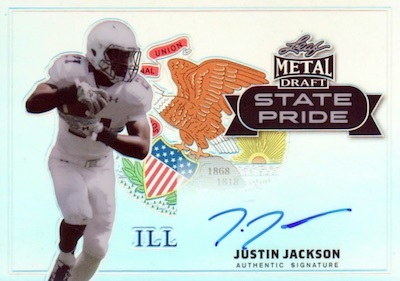 Generally a popular pre-draft release for collectors, 2018 Leaf Metal Draft Football emphasizes on-card autographs and colorful parallels. The autograph-only set includes five signed cards in every box. Featuring some of the best rookie names heading into the NFL Draft, the 2018 Leaf Metal Draft Football checklist takes advantage of expectations for a strong quarterback and running back class. The set has also placed a greater focus on skill position players, which should yield greater returns. 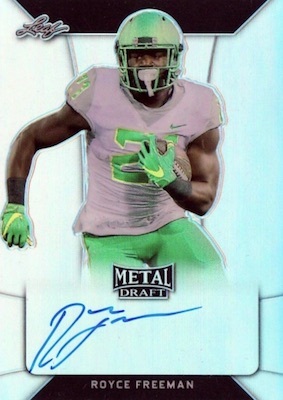 In typical Leaf fashion, 2018 Leaf Metal Draft Football keeps to just a few main designs. 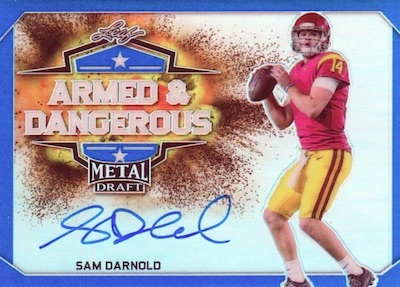 In addition to the Base Autograph set, brand staples Armed and Dangerous, State Pride and Touchdown Kings round out the choices. Although this is the same selection as the 2017 product, additional elements of note include a new Prismatic color parallel and added Wave editions for each parallel color in the rainbow. As a result, 2018 Leaf Metal Draft Football has greater color totals across the run. However, the overall production is "cut substantially" in comparison to 2017. 2018 Leaf Metal Draft Pink Nick Chubb Auto #2 5! SSP! 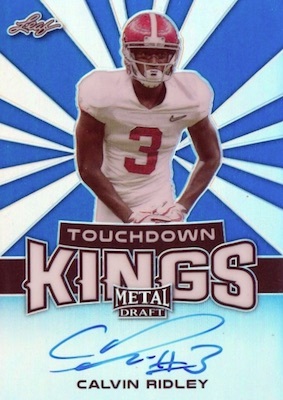 2018 Leaf Metal Draft Black Auto Calvin Ridley #10 15!! SSP! Redemptions noted. Some cards have both live autographs and redemptions in the set. See the spreadsheet at the bottom for specific parallel print runs. Buy 2018 Leaf Metal Draft Football autographs on eBay. PRISMATIC PARALLELS: Blue #/35, Purple #/25 or #/15, Pink #/20 or #/10, Black #/15 or #/7, Green #/10 or #/5, Orange #/7 or #/3, Red #/5 or #/2, Gold 1/1, Super 1/1. PRISMATIC PARALLELS: Wave (No Mayfield*), Blue #/50, Purple #/25, Pink #/20, Black #/15, Green #/10, Red #/5, Gold 1/1, Super 1/1 (No Mayfield*). PRISMATIC PARALLELS: Wave, Blue #/35, Purple #/25, Pink #/15, Black #/10, Green #/5, Red #/3, Gold 1/1, Super 1/1. 130 cards. Serial numbered 1/1. View the 2018 Leaf Metal Draft Football checklist spreadsheet. cards are out – where is the checklist ??????????????????????? This is not scheduled to release until April 6. Nothing should be out yet. I really like this product as an alternative to most products panini puts out. I do wish one company would take the lead and stop creating additional parallels and although leaf has added some appears they’ve used some moderation. why do people buy this no logo garbage ? I don’t mind the no-logos, I’d rather have no-logos than buy boxes full of undrafted free agent autos that are stuffed in Panini contenders boxes. How do we leave Bo Jackson out? On a thin Auburn year it makes sense to run a 4 different card release with some low print Bo Jackson autograph. I guess I’ll chase hit Elite Draft stuff. Bummer! Maybe no logos but 10 times better than 8,000,012 sticker Autos and practice card players you get in a box of Contenders.